Already have a cash advance? Your advance is on the way. Contact us if you don't see it in your PayPal account within 24 hours. Welcome to faster, easier business funding with PayPal Working Capital. *Subject to eligibility. A minimum level of repayments is required. Terms and Conditions apply. Our simple application process and quick funding lets you apply and, if accepted, receive funds in your account in minutes. You pay just one fixed fee, with no interest or other fees. There are no additional charges for early repayment or fluctuations in sales. You choose the cash advance amount and repayment percentage that fits your needs and business model*. Approval is based on your PayPal sales and account history. No need for extra documentation and your credit score is unaffected. *Minimum payment required every 90 days. See Terms and Conditions. See how much funding you could receive. *The maximum cash advance amount offered could be up to 35% of your annual PayPal sales, with a maximum of £150,000. Your maximum cash advance amount is based on your PayPal sales volumes, account history, and any prior usage of PayPal Working Capital (where relevant). Applying has no impact on your business or personal credit score and, if you're approved, you'll get your funds in minutes. Repayments are automatically deducted from your PayPal account when you have sales, based on the repayment percentage you choose when you apply. For periods when you don't have sales, you won’t make any repayments. However, regardless of sales volume, you’re required to meet a minimum level of repayments every 90 days. This will be no more than 10% of your total cash advance (including the fixed fee), but the exact amount will depend on your business profile and the options you select. You’ll be told your specific amount in your terms and during the application process. For full details and other requirements that apply, see the FAQ. You can also make additional payments to repay your cash advance sooner – without any additional charges. PayPal Working Capital makes it faster and easier for your business to get funding. *In some cases, the application decision process may take up to 7 days. ^Source: PayPal competitive analysis. Have repaid any prior PayPal Working Capital cash advances. Additional data regarding your PayPal account history, business performance and your financial position are also considered as part of the application process, to determine if you are eligible for PayPal Working Capital and to determine the size of the merchant cash advance available to you. *Eligible sales are those made through your PayPal account net of any transaction reversals and excluding any non-business person-to-person transfers. Also excluded are any transfers or deposits you make yourself into your PayPal account, and any gambling transactions. There’s just one fixed fee, which will be explained before you complete your application for PayPal Working Capital. There's no interest, no late fees and no fees for any additional repayments you make. 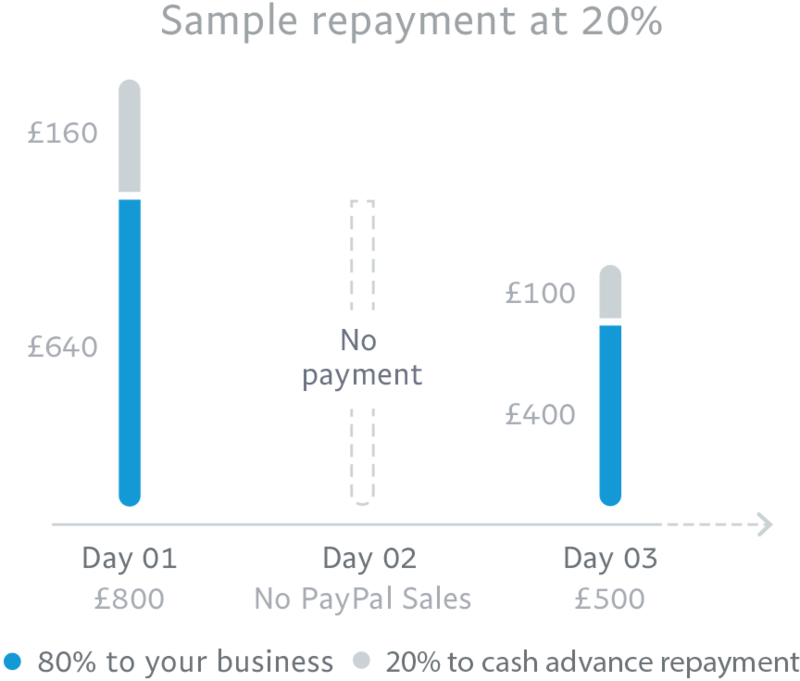 Repayments are automatically deducted from your PayPal account as a percentage of each sale until the cash advance amount and fixed fee are paid in full. You can also make additional repayments or even pay the cash advance in full without additional charges. If you have a PayPal Working Capital account you can access it by clicking on the login button at the top of the PayPal Working Capital landing page, or from the link on your PayPal account servicing page. PayPal Working Capital - a trading style of PayPal (Europe) S.á r.l. et Cie, S.C.A. Société en Commandite par Actions. Registered office: 22-24 Boulevard Royal, L-2449, Luxembourg. R.C.S. Luxembourg B 118 349. Use the Sample Merchant Cash Advance Calculator to see how our terms work. This is one of the key factors we use to estimate your fixed fee. Premier account holders must process at least £12,000 and Business account holders must process at least £9000 in qualifying, annual PayPal sales to be eligible to apply for PayPal Working Capital. 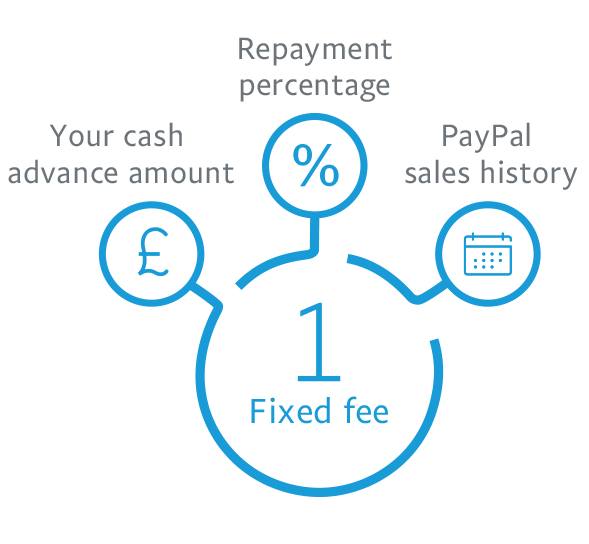 The cash advance available can be up to 35% of your annual PayPal sales, to a maximum of £150,000. This amount should be no more than 35% of your estimated annual PayPal sales, up to a maximum of £150,000.